The Wall Street Journal reports in today’s paper that the next generation of robot vacuums are now available. The article describes a number of brands and the features that they offer. I have never used one and can’t see myself ever being in the market for a robot vacuum. This is probably more of a generational thing than a negative response to the technology. I am just not sure that I would achieve a significant gain in the quality of life by running right out and buying one. My sister Lisa, who is significantly younger than me, did the calculus and decided that a robot vacuum was just the thing for her household. I am sure she did her research and consulted with her husband. She failed to consult with her two dogs, collectively known as the raptors. These two are such abject cowards that they have been chased out of the room by a cockroach. On its maiden voyage, Lisa activated the robot as she went out the door to go grocery shopping. She failed to tell the raptors of the new household economy. What happened next must be pieced together by the physical evidence, since the raptors aren’t telling. I understand the new models are equipped with a camera, maybe for this purpose? The robot activated itself and set off on its appointed rounds. I’m guessing that curiosity on the part of Sasha and Sky, the raptors, soon gave way to abject terror. After all Mom had always been present in the past when that noisy sucking thing came out. This new noisy sucking thing engaged in a relentless pursuit of the raptors. Try as they might they couldn’t get away. One or the other of the raptors was so traumatized she dropped a steaming pile of dog crap somewhere along the vacuum’s rounds. 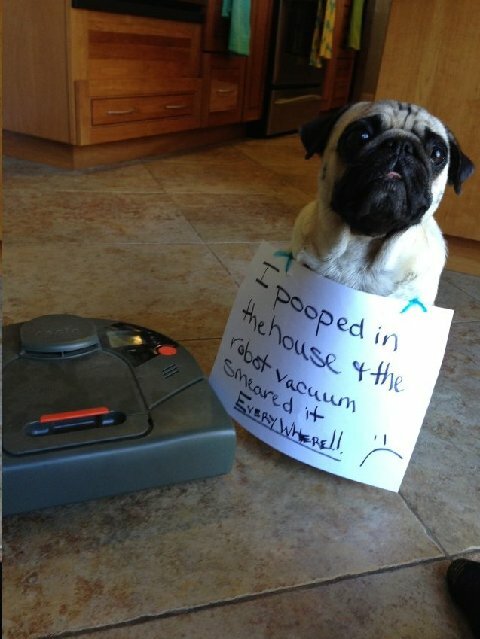 Robotic vacuums do not pick up dog crap. They do however, note its presence and cause the tiny robot brain to return to that spot over and over again in a vain attempt to pick up the turd. Did I mention the beige carpet? All was not lost, when Lisa returned home she was able to chart the exact path the robotic vacuum took and from the dog pooh track marks determine that all and all the robotic vacuum had effectively covered the room. Posted in Uncategorized and tagged dogs, household economy, robot, unintended consequences. Bookmark the permalink.